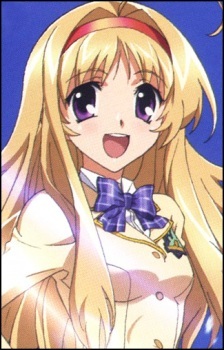 Nanami is the younger sister of Takumi and is one of the Female Characters in ChaoS;HEAd. Nanami's first appearance in the Anime is where she visits Takumi in his bunker to try and take him out to buy a mobile phone, however he refuses. She trys again later however and eventually succeeds. Nanami's role in the show is very sparse until episode 9 where she is kidnapped and taken to the Noah II base. She is then tortured by her kidnappers in an attempt to reveal her Di-Sword. When Rimi arrives in an attempt to save Nanami, her Di-Sword appears, confirming her as a Giglomaniac. After escaping, Shogun appears and reveals to Nanami that he is her real brother, and that he took away her memory so she wouldn't feel pain when he died. Nanami claimed that she never wanted to lose her memory las she wanted to be by his side, however Shogun refuses and says that Takumi is her brother now, and she should continue her life with him. Nanami accepts this and says that even though Takumi is an illusion, he is still her brother. Here they accept each other's love and then team up with the other Giglomaniacs to repair the city after defeating Noah II..